← A bite of Newton with your morning coffee. I just got home from my Dad’s Memorial service. We formally laid him to rest in his 95th year, the vast majority of which he walked with His God. With 3 sons, all in ministry, you can imagine that a LOT was said. And there were many precious things said by others who came from all parts (the Parkers and Cohens from S. Carolina); the Bergerons – who I didn’t get to see from New Hampshire, and Ferguson extended clan from Canada. And so very many others who made it a wonderful day indeed – so many who I didn’t get to greet and thank personally. My small part was to compose a brief eulogy which I leave you with here. I trust it is a blessing to those who go on to read it. The picture above is of Dad snuggling with his great-grandson Jackson. The practice of eulogies began around 200 years before Christ with the Greek poet Callimachus. It was called an “elegy” back then, and was just an outpouring of emotion at the loss of a loved one. Gradually it shifted to include some facts and memories about the one lost, and I am glad it did – for it paves the way for what I want to say today. My Dad, our Dad, Ray Ferguson was a great man. I use that word carefully because greatness in many minds has certain connotations, and Dad’s greatness was different from that. Dad never wrote a book. He never broke any of the celebrated records of human achievement. He never obtained world-wide fame or acclaim. He never climbed Pike’s Peak or Everest. He never built anything nor established a school or other institution. But he was still a very great man. I could talk about how Dad, having no good father figure of his own, came to be such a devoted family man. Or how his sense of humor ran the gambit from semi-funny “puny” jokes – to practical jokes. I could talk about his being his own car mechanic until he wasn’t able any more, and was always his own electrician and plumber – even when that meant setting Nancy & Ivan’s house on fire sweating a joint. Or getting censured by the umps at the Church softball league we were in for heckling the other team too much. How when Kenny and I were younger (I won’t say little) and bought a bunch of firecrackers – and other assorted incendiary devices – when we were on a trip to Canada / we confessed as we drew near the border that we had them. Dad was not happy, but his solution made Mom even less happy. After letting us know the bad position we would have put everyone in had they been discovered coming back into New York State – Dad collected our stash. Pried off a hubcap – sealed them up in there, and abetted our mischievous act by helping us smuggle them in. Or I could wax on how he instructed us on how to stuff a potato up the tailpipe of a victim’s car to harmlessly prevent it from starting – or how to run a wire from the hot terminal on the master cylinder to the positive terminal on the horn so that the victim’s horn would blow continuously while their brake lights were on. And many, many more antics. Those were all great things, but not what made him great. That said, let me note some of true marks of Ray Ferguson’s type of greatness. While I attempt that, please note, this is not an attempt at hagiography. The truth is, as it has been noted by others, that great men have great flaws, and that was as true of my Dad as of anyone else. But he did have significant touches of greatness, some of which I hope may one day be noted of me. I’ll mention just a few. There were in fact many to choose from. Dad was a great herald of the Gospel and saving grace of Jesus Christ. He loved to preach a great grace for salvation. And he understood himself to be in great need of and a grateful recipient of – that grace. Herein was one of those mixed realities that afflicts all those who know Jesus Christ savingly – some to greater or lesser degrees. I do not know anyone who was more pained by his own sinfulness, while at the same time being more awed and grateful at the great grace he had received in Christ Jesus. He ached to sin no more. And he knew that sin’s only answer was in the substitutionary death of Jesus Christ on the Cross of Calvary. 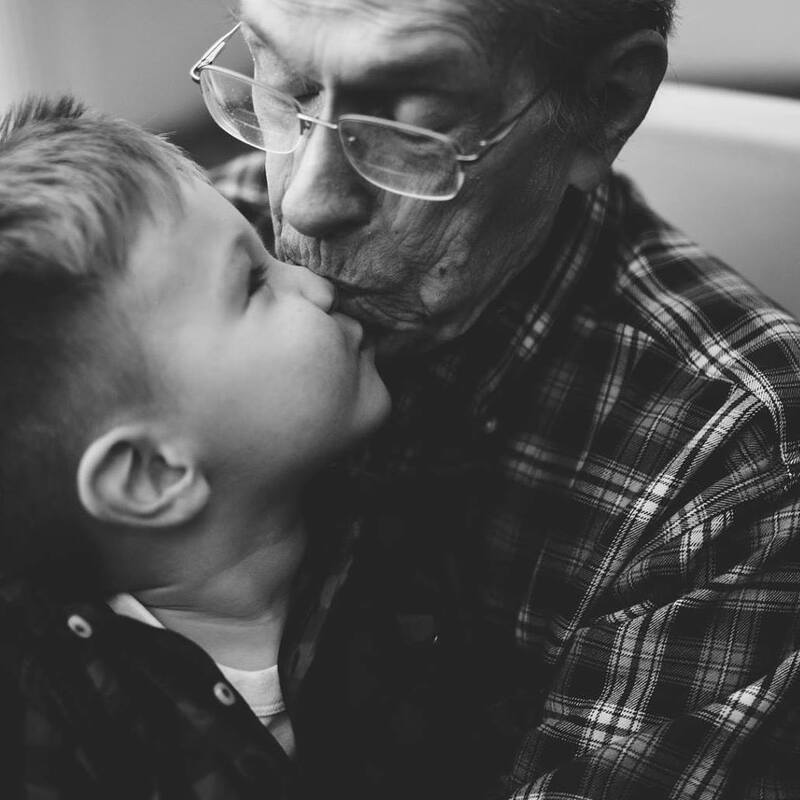 Dad loved the Gospel of sovereign grace, because he knew he had been rescued from his own condemnation through no work of merit of his own – but only the sole and sovereign act of God in carrying out His electing love. Dad was a great man of prayer. By that I do not mean that he spent inordinate amounts of time locked away from life in the prayer closet like a hermit. Rather that he believed that God met him when he prayed, that Christ had truly opened that door for the Believer through His death, burial and resurrection. And many here can attest to the fact that that WAS our experience when he prayed for us – that Dad entered God’s presence with his prayers, and that God would hear, and answer. He believed greatly in prayer because he believed in a great God who greatly answered prayer. And one of the greatest gifts he left us as his children, and me in particular, is that he taught us to pray. For a number of years, the 6am prayer time at ECF consisted of only Dad and myself. And those were precious moments I will never forget, and be eternally grateful for. Most mornings after that prayer time, he and I would go for breakfast and invariably that time was spent in discussing the great truths of Scripture and the things we had both been reading or contemplating that had stirred our souls. Dad had a great love of and reverence for The Word of God. This is the second great gift he passed on to us especially as his children – to love God’s Word. He read it and studied and taught it and preached it as best and as often as he could. All of us can attest to his repeated phrase when counseling us on debating either doctrine with anyone, or those bound in darkness by the cults: “sew them up to the Bible” he would say. He believed and knew the truth was to be found there, and he loved it. And wanted others to love it too. He was a man of great conviction. Whether he was right, or whether he was wrong – and there were times on both sides of that ledger – if he was convinced of the truth of his understanding, he was true to it to the end. In this he always exhibited a very great authenticity. And sometimes, while he loved to give to and do for others, he could sometimes make it hard to love him in return. Nevertheless, he stood by his convictions and lived to them as much as he was able. This particular aspect of his greatness also demonstrated itself in his unbreakable loyalty. Could he freeze you out at times? Yes. But that never crossed over into abandonment. Those who were “his” – within his sphere of love and influence, would always be his in his heart and mind – no matter what. He was a great lover of people’s souls. While Dad dearly desired to be well thought of by others, he never sought to be thought of as other or more than what he was – he never sought to be thought of as occupying some higher social station or having accomplished something he hadn’t. He never sought fame in the desire for being well thought of by those who knew him. And seeing himself as kind of everyman in this way – no one was too low or two high to have him care for their souls. Dad was no stranger to being able to deliver sharp censures and rebukes. But if you knew him, you always knew that underneath it was a deep commitment to the recipient – that he wanted them to be better for the exchange, and not worse off afterward. There are any number of other things I could comment on here, but time does not make that practical. Dad taught me to love God’s Word, and to love the God of the Word; and to pray. And those are bestowals of the richest and most blessed kind. They are treasures with eternal ramifications and benefits. They are great gifts indeed. I am so glad you are with the Jesus who loved and died for you, and whom you so loved, and lived for.